The second day of my Seoul trip was highly anticipated because it was my very first hanbok experience day! 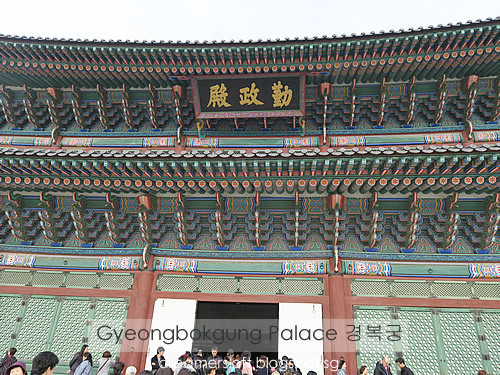 Ever since I started watching Korean historical dramas (saguek), I wanted to try on hanbok because they look so elegant; it would be so fun walking around the royal palace in hanbok! 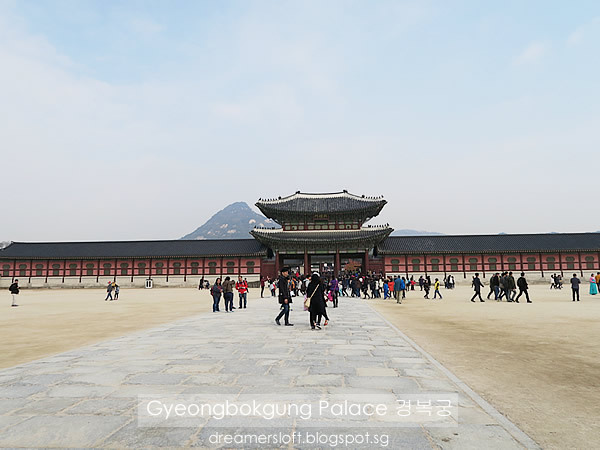 There are a number of royal palaces in Seoul, but due to lack of time, I guess we could only explore one of them; decided on Gyeongbokgung, since it's the most popular and iconic one. 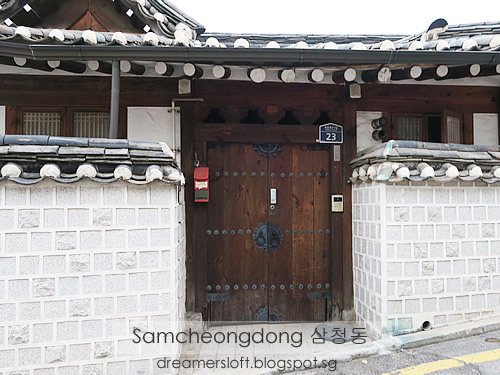 Prior to the trip, I did some research on places to rent hanbok; there are many shops in areas such as Gyeongbokgung palace, Samcheong-dong, Bukchon Hanok Village, Insadong etc, so much so I was spoilt for choices. 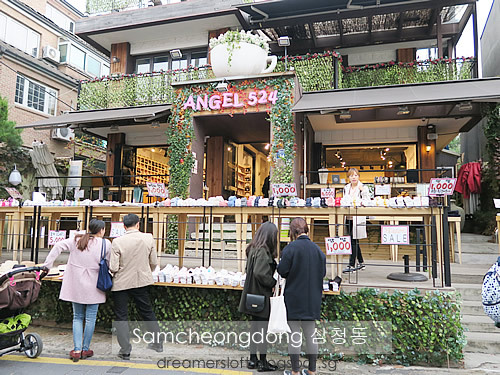 In the end, settled for this particular shop, Hanbok 3355, Samsam-O-O which is located a short walk from Gyeongbokgung. 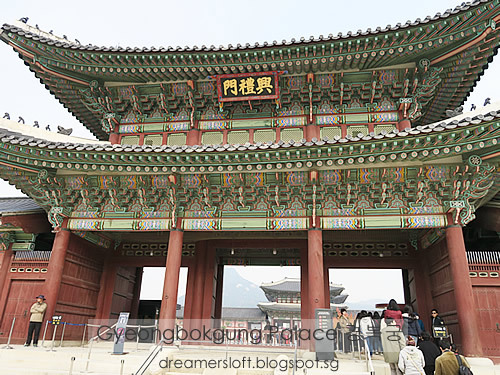 My plan was to visit the shop early at 9am, get dressed and head to Gwanghwamun gate by 10am to view the royal guard changing ceremony. When I made reservations, the staff replying my email assured me that we would be ready before 10am and make it in time for the ceremony. Never mind, we did get our photo taken with the chief guard. I wonder how bored the guards feel? Having to stand there during their guard duty hours and take countless photos with tourists? 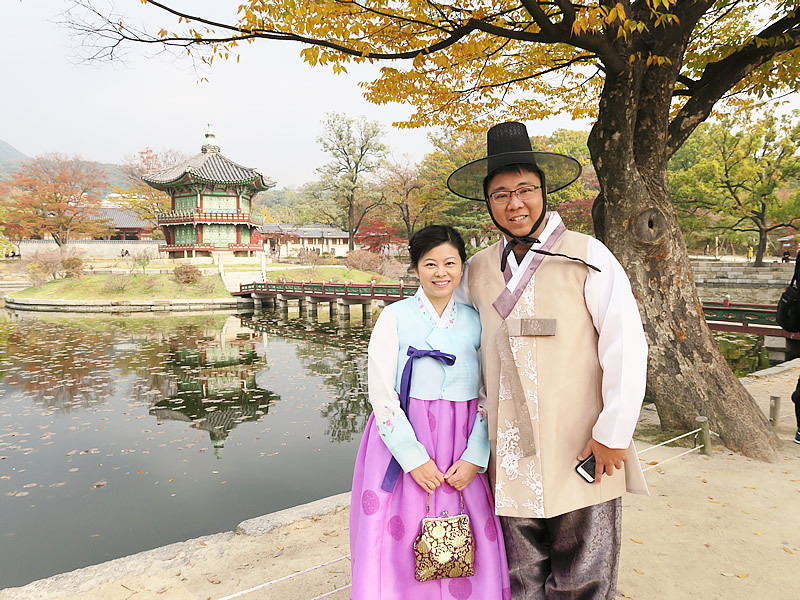 After photo-taking with the guards, we proceeded into the palace grounds where we were granted free admission for wearing hanbok. Haha. Then again, the admission fee is actually very affordable. 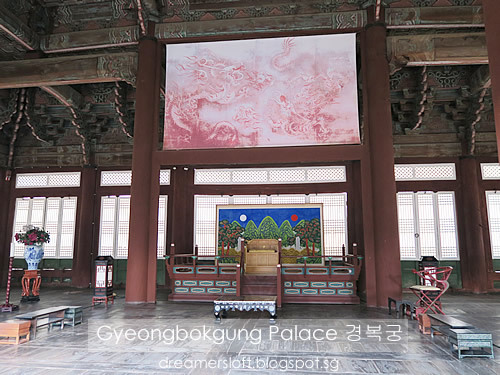 Geunjeongjeon Hall is the Throne Hall, where the king granted audiences to his officials, presided over large official functions and met foreign envoys. 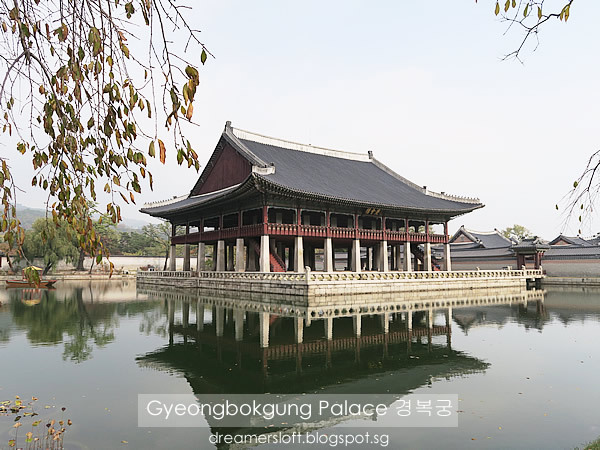 Geunjeongjeon Hall is the largest and most formal hall in Gyeongbokgung Palace. Council Hall where the king routinely discussed national affairs with his court officials. 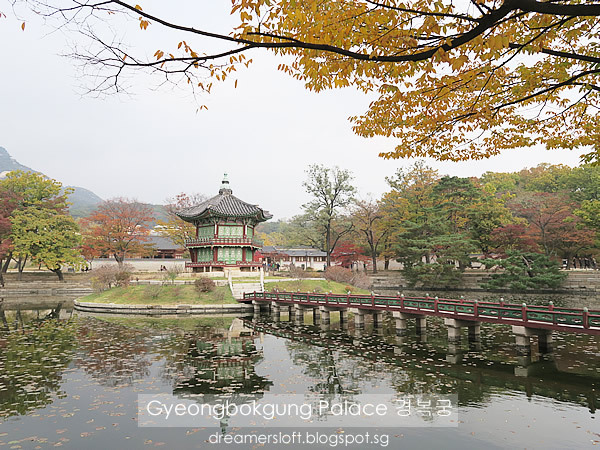 The palace grounds is vast, we took our time and walked around admiring the architecture and scenery with no particular route. 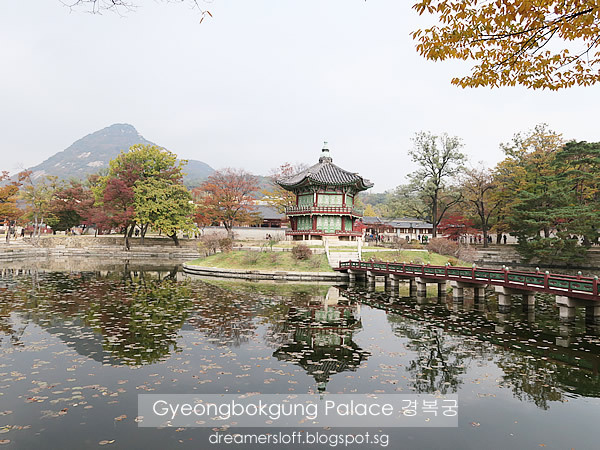 At last, we reached the most beautiful place of the palace (in my opinion), the Hyangwonji Pond and Hyangwonjeong Pavilion. This place is simply breathtaking, especially with the romantic colours of autumn foilage. Do we look like a couple from historical times? Haha, guess not with the HB's specs and mobile phone. 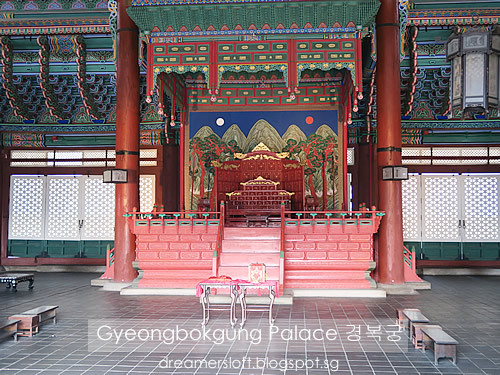 Gyeonghoeru Pavilion, where the king threw feasts for foreign envoys or his court officials. 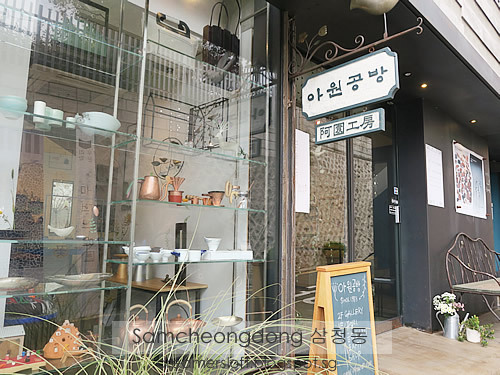 After walking around for more than an hour, we were famished and proceeded to Tosokchon Samgyetang Restaurant, located about 10mins' walk west of the palace. 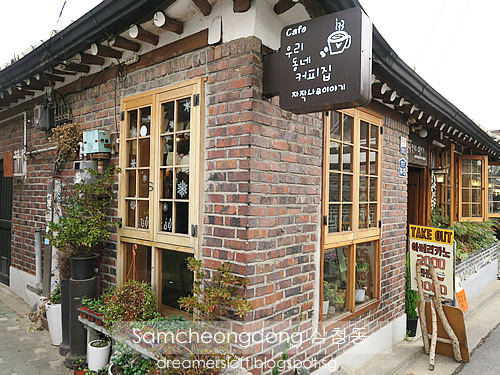 This is supposedly the most famous restaurant selling Samgyetang (ginseng chicken soup) in Seoul, with its premises within a hanok (traditional house). When we reached, there was already a long queue and we waited about 15 mins to get a table. Shared a Tosokchon Samgyetang (chicken soup with ginseng, glutinous rice, various nuts/seeds/herbs,a nourishing tonic health food for the Koreans) and a Haemul Pajeong (Seafood and Green Onion pancake). The chicken soup was really good, very soothing and light on the palate, warming our tummy and body :) The seafood pancake was quite yummy too, crispy on the outside and very flavourful. Luckily we decided to share as the portions were quite big, won't be able to finish one chicken on my own, not to mention a pancake. 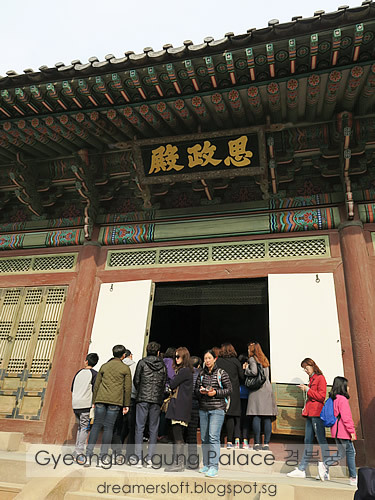 Time to explore Samcheongdong-gil 삼청동길 which is to the east of the palace. There are many quaint cafes and interesting shops around the area, selling exquisite art, jewellery, zakka items, fashion items etc. Reminds me a little of Jiyougaoka in Tokyo. 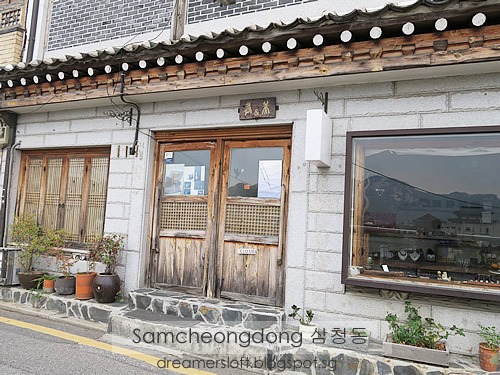 Some of the shops are converted from traditional Korean houses (hanok); and some hanok remains as residents' quarters. 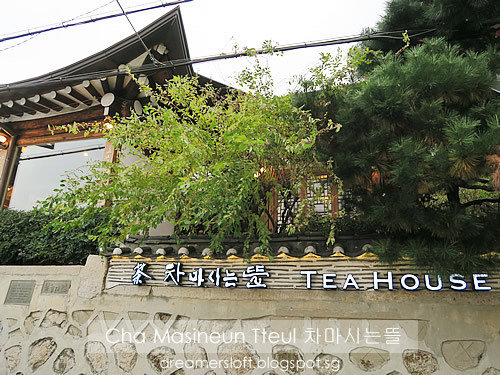 We stopped by this traditional Korean tea house recommended by my friend, SY who studied short-term Korean language course in Seoul before. 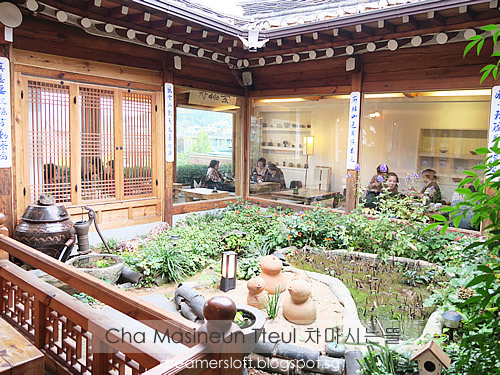 Really liked the ambience at this tea house perched along a hilly road, overlooking the surrounding mountains and hanok. 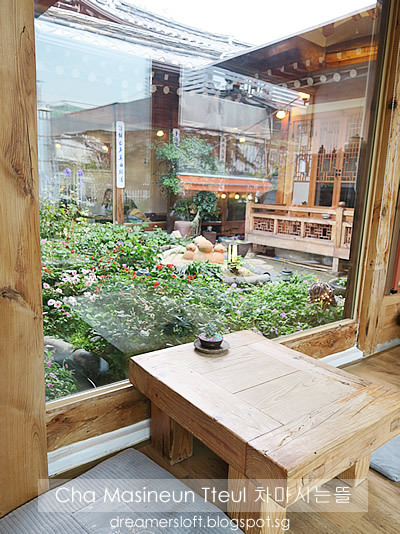 Lovely little garden within the tea house compound. HB ordered a Yujacha (citron tea), a traditional herbal tea made from the citrus fruit yuja, whereas I tried the Omijacha or Omija hwachae, meaning "5-flavour tea", a kind of traditional drink made of fruit herbs called omija. 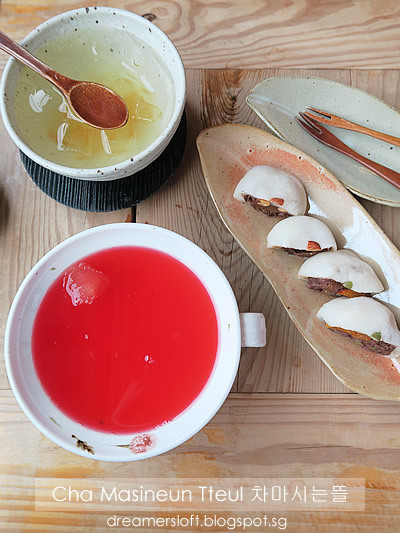 It is usually served during hot summer days as energy replenishment and for quenching thirst. We also ordered a mochi dessert which was not on the menu (saw two Japanese ladies beside our table eating it). The mochi was so chewy and yummy. 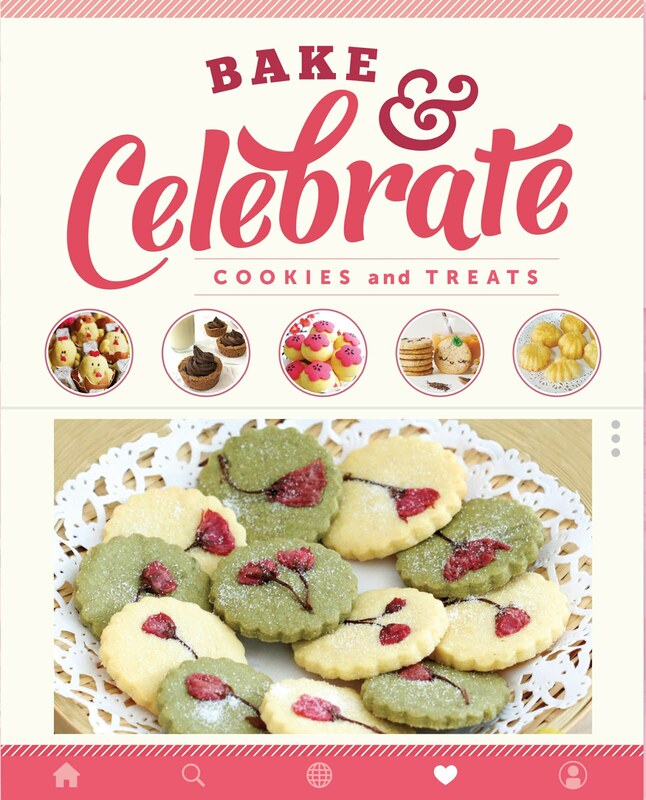 One piece had traditional red bean and dried persimmon filling, whereas the other had chocolate praline filling. 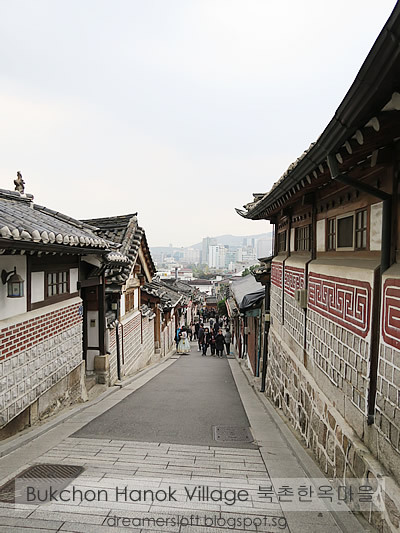 The Bukchon Hanok Village is actually not slated as a tourist attraction, but because there are many clusters of hanoks in this area, it gained popularity and many tourists started visiting the area. In fact, this area remains a residential neighbourhood and many residents still reside here. Some of the hanoks are converted to guest houses. 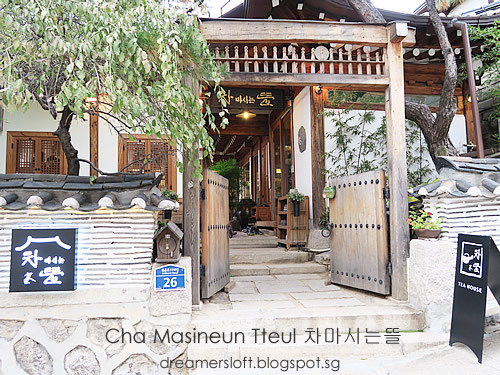 When we were strolling around the area, indeed there were a lot of visitors taking photos, and at every junction or few hundred meters, there were actually ahjumma and ahjusshi holding signage reminding visitors to lower their volume. Doors of most household also post notices reminding visitors to be silent. I do pity the residents staying here, it's kind of privacy intrusion with their living quarters being photographed all the time. I guess I'm a culprit too, so quickly snapped a few photos and scurried off. 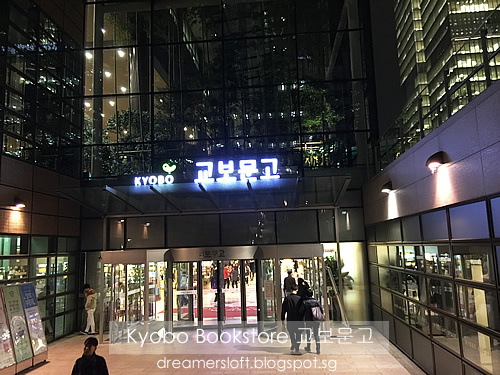 Thereafter, made our way to Kyobo Book Store Gwanghwamun Branch 교보문고 광화문점 (http://www.kyobobook.co.kr/index.laf) as we liked to check out the book collection there. Besides Korean books, there are a small selection of English and Japanese books as well. The bookstore is huge and hosts CD/DVD/record section, IT and accessories section, stationery and novelty items section, lifestyle products etc. We ended up spending more than an hour there, I bought a Korean cookbook in English language and Korean language beginner guide book, whereas HB grabbed several English Engineering books which are priced very reasonably (much lower than SG and even US). 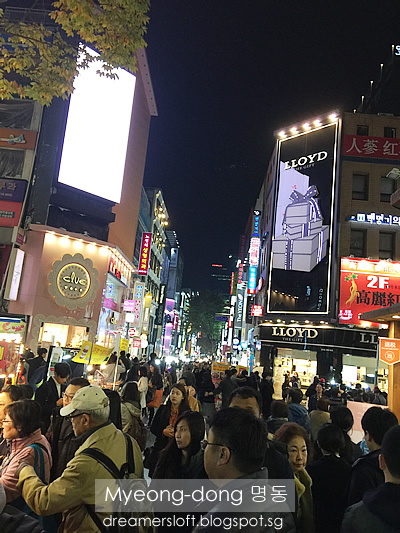 After that, we took a cab back to the hotel to drop off our purchases and headed out to Myeongdong shopping street. 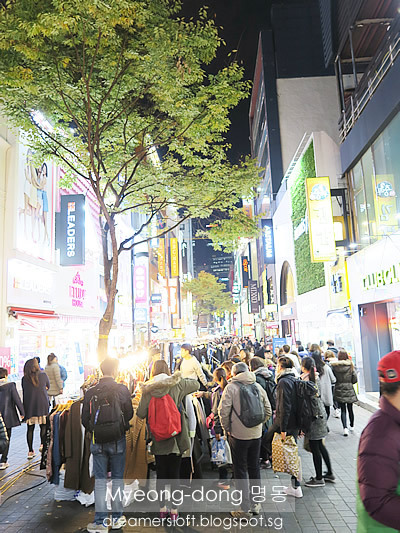 Myeongdong street was busting with energy and got more crowded the later it gets. 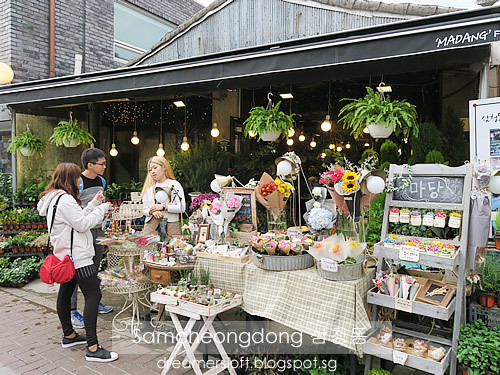 The whole area is touted as the beauty and fashion street of Seoul with many well-known international and Korean brands selling fashion, accessories, cosmetics, beauty care etc etc. Most shop assistants here are Chinese or speak Mandarin so no problem in communication, but they can be rather aggressive with their hard-selling antics. Streets were lined with stalls selling fashion and accessories, as well as street food. We decided to have street food for dinner! 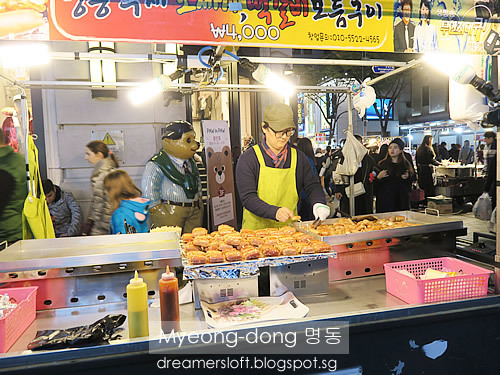 Many stalls sell sausage here, I guess it's a popular form of street food. Some are with cheese, some with tteok (rice cake). 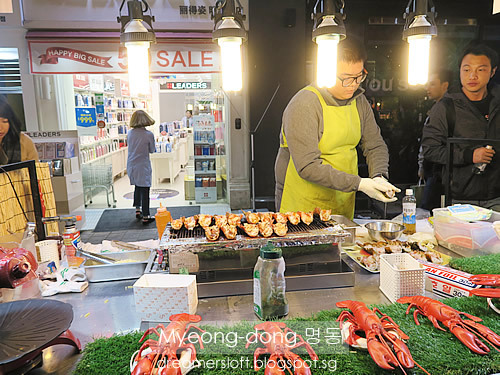 Grilled seafood with cheese is very popular as well, saw quite a few stalls selling different variations of grilled seafood. Traditional Korean porridge. I guess great for cold wintery nights. 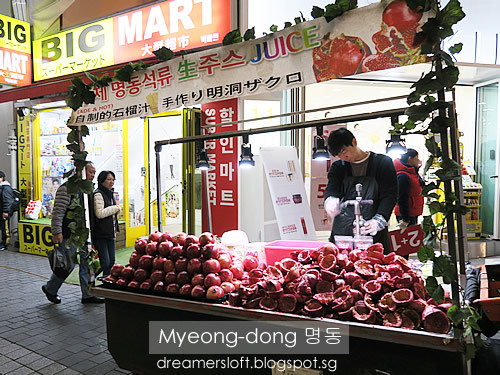 Freshly-squeezed pomegranate juice is popular, it comes sealed in a clear plastic pouch, nice packaging. 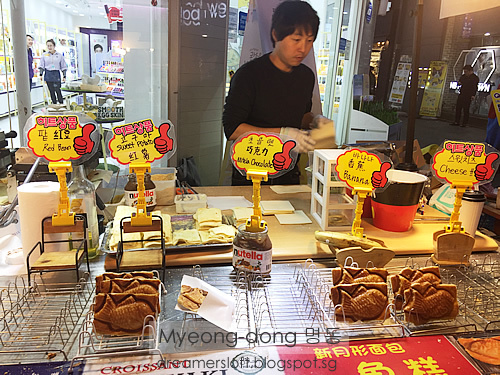 This fish-shaped "corissant" made using puff-pastry and comes with several fillings was super yummy, very crispy and buttery. 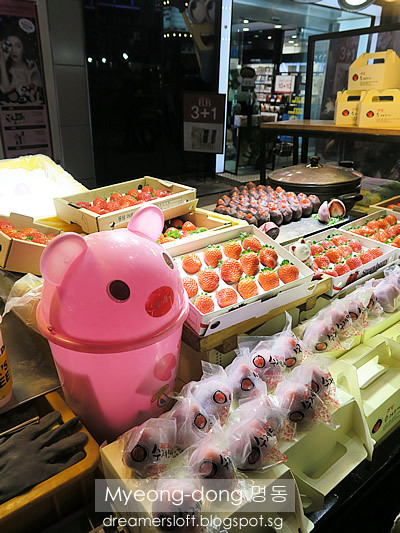 Another popular snack, strawberry wrapped with red bean and mochi. 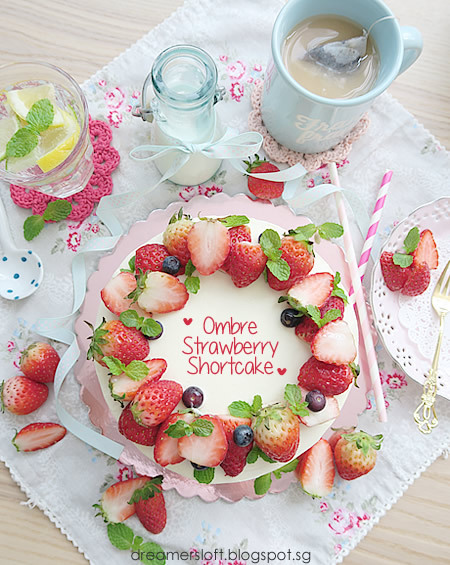 Quite yummy! 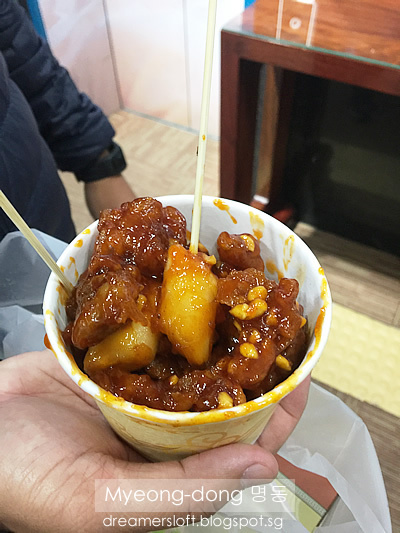 This seemed to be quite popular street food too, Fried chicken and rice cake in spicy sauce. It was not bad, but the sauce was a little overwhelming, and tasted nice only when eaten hot. 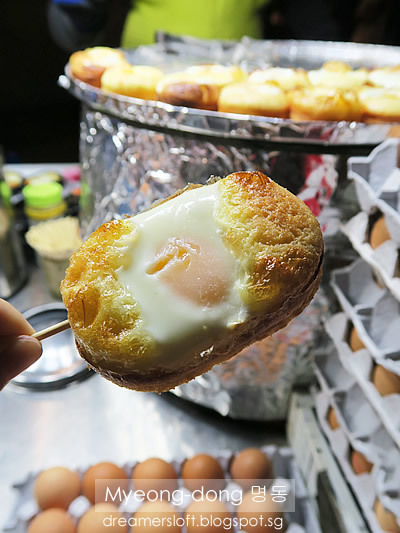 I got to try my Gyeran Bbang which is Korean Egg Bread, one of the most famous and representative of Korean street food probably. 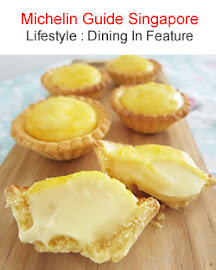 The bread was sweet and had a cake-like fluffy and tender texture, with an egg in the middle. 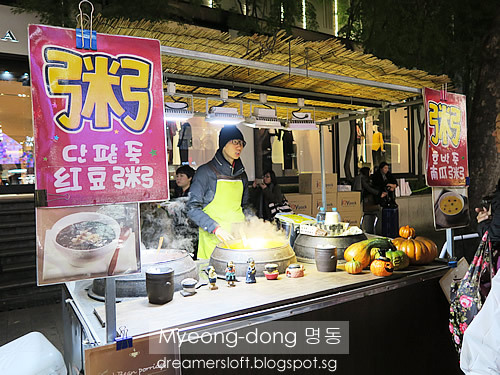 I love it, really a great street food, especially for cold days!! 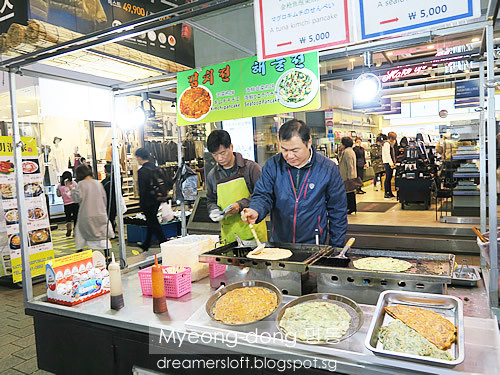 We only tried a few stalls as these street food were rather filling and we simply didn't have tummy space to hold more. There were many more stalls that I didn't manage to take photos as it was too crowded. 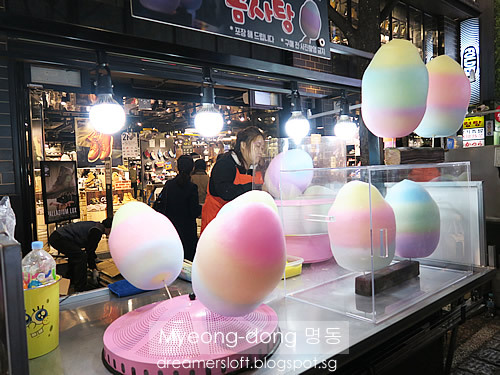 Stay tune for Day 3 where we visited Namdaemun, Ewha Women's University, Hongdae Free Market and Hongik University Street. 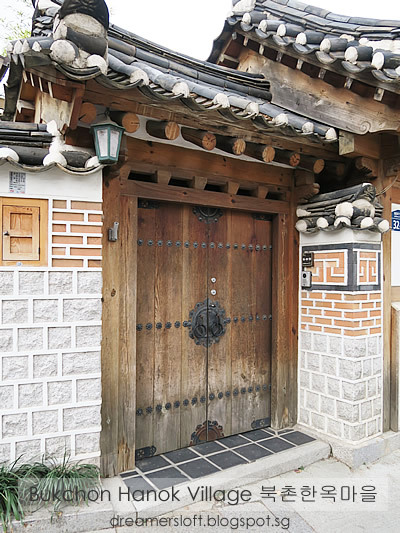 Cheap accommodation in Seoul at eGetinnz. Get more bang for your back, and renting for a vacation rental gives you better options to where you wanna go and spend time. Live like a local.